Chimney Rock State Park is part of the larger Southern Appalachian Mountain range that extends from northern Alabama to northern Virginia. It is located on the eastern edge of the Blue Ridge Mountains in southwestern North Carolina, situated within a band of mountains and foothills, known geologically as the Inner Piedmont Belt. The park is 25 miles southeast of Asheville, North Carolina. Chimney Rock State Park is comprised of notable landscapes and significant ecological areas. Portions of the state park are located in Buncombe, Rutherford, Polk and Henderson counties, and include the following: Chimney Rock Mountain, Hickory Nut Falls, World’s Edge, and portions of Rumbling Bald, Stony Mountain, and Cane Creek Mountain. A 4,531-acre expanse, Chimney Rock State Park straddles two physiographic regions (Blue Ridge Mountains and Piedmont). Most of the state park is also located within Hickory Nut Gorge, a geographic region which extends northwest to southeast from the Continental Divide south to Lake Lure. The gorge is carved by the Rocky Broad River, which flows between the exposed granite domes and cliffs of Round Top Mountain and Chimney Rock Mountain along U.S. Route 64/74A. The Hickory Nut Gorge Macrosite comprises the entire length of the gorge and covers nearly 30,000 acres in Buncombe, Henderson, Polk, and Rutherford counties. The park contains one of the largest concentrations of rare species within the Blue Ridge Mountains and is known to support over 90 rare plant species, of which three dozen have state or federal designations. The park plays a prominent role in landscape-scale protection. And Lake Lure, the area’s most notable water feature, is found on the eastern edge of the park, although no park property adjoins the lake. Chimney Rock at Chimney Rock State Park has been a tourist destination in western North Carolina since a simple stairway was built to the rock's summit in 1885. In 1902, Lucius B. Morse of Missouri bought the site, and the Morse family developed park facilities in 1916. The attraction included a tunnel and elevator to the rock summit, a nature center, and a network of hiking trails to geologic points of interest including the 404-foot-tall Hickory Nut Falls. The private Chimney Rock nature park opened to much fanfare on July 4, 1916, the same year that North Carolina's first public state park, Mt. Mitchell was created. The opening of the park was preceded by the development of the Chimney Rock Highway, a three-mile stretch of road that would take visitors from the then Charlotte-Asheville Highway to the base of Chimney Rock. The road was described in the papers as a series of "'hair pin' curves" and "marevelous and interesting switch-back reverses" winding their way to the base of the rock, and it was completed just in time to accommodate the cars of a reported 1,000 visitors who traveled to the park for the July 4th opening event. Two strong and rustic bridges crossed the Broad River along the route to the rock base. One of these bridges was washed out in devastating floods that swept the western part of the state later the same month. The event was heavily promoted, and an advertisement in the Asheville Sunday Citizen a few days prior stated that a "Superb Flag 15X25 feet [would] be unfurled from the Top of Chimney Rock at 12 o'clock Noon", followed by "Don't Fail to Witness the Most Unique and Thrilling Fourth of July Celebration Ever Held in Western North Carolina." Another advertisement in the Charlotte Observer encouraged: "Spend a real holiday on the greatest precipice East of the Rockies." Following the celebration, the French Broad Hustler reported that the massive 475-square foot "Old Glory" was hoisted up a 60 foot flag pole atop the rock at 1:20 p.m., as many visitors looked on, to see it "stretched out in the air by the mountains' never dying breezes." The land's previous owner and a native of the area, Jerome Freeman, raised the flag up the pole. He reportedly held the dream of a road to the rock, long before the Morses purchased the site. An artifact remains that gives an inkling of the event, a photograph taken circa the 1920s of a massive U.S. flag waving in the breeze (see image above). 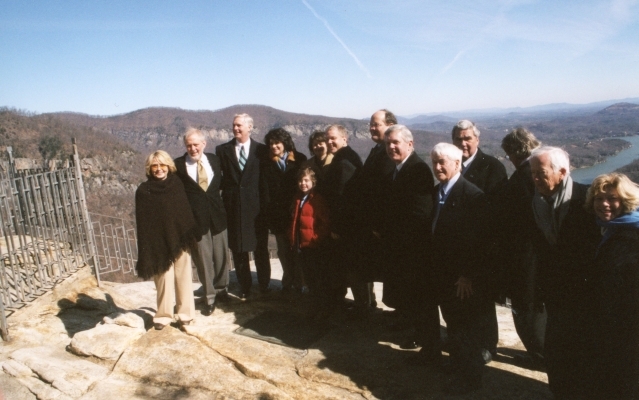 In 2005, the North Carolina General Assembly authorized a new state park in the scenic Hickory Nut Gorge area of western Rutherford and the surrounding counties of Polk, Henderson and Buncombe. Later that year, the first tract of land to form the state park was purchased. Since then additional tracts have been added. Early acquisitions for the new state park included a 1,568-acre tract known as World’s Edge, land on Rumbling Bald Mountain, and land near the Bat Cave community. The most notable was the 2007 transfer of the historic private Chimney Rock Park along with the 315-foot spire on the gorge's southern side. Originally named Hickory Nut Gorge State Park, Chimney Rock State Park is one of eight state parks established as part of the 2002 New Parks for a New Century initiative undertaken by the North Carolina Division of Parks and Recreation. This initiative was launched in conjunction with the North Carolina Department of Environment and Natural Resources’ “One North Carolina Naturally” program that sought protection and stewardship of the state’s most important natural resource areas. In 2007 the North Carolina General Assembly changed the park's name to Chimney Rock State Park. In 2015, The Nature Conservancy transferred 536 acres adjoining the park to the State of North Carolina for inclusion in the park. This acquisition enlarged the conservation corridor from Chimney Rock to the Conservancy's Bat Cave preserve. North Carolina Division of Parks and Recreation. "Chimney Rock State Park." North Carolina Department of Natural and Cultural Resources. 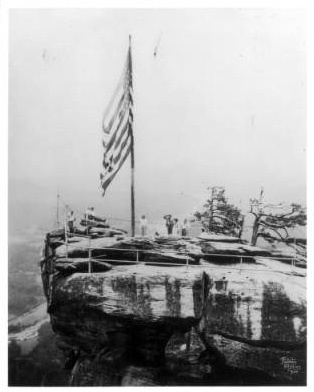 https://www.ncparks.gov/chimney-rock-state-park (accessed January 24, 2019). North Carolina Division of Parks and Recreation. "North Carolina Purchases Natural Icon" in Annual report of the North Carolina Division of Parks and Recreation. Raleigh: north Carolina Deaprtment of Environment and Natural Resources, 2008. http://digital.ncdcr.gov/cdm/ref/collection/p249901coll22/id/172123 (accessed September 1, 2015). Chavez, Karen. "Chimney Rock State Park Grows." December 15, 2015. Citizen-Times online. https://www.citizen-times.com/story/news/2015/12/14/chimney-rock-state-park-grows/77294070/ (accessed December 15, 2015). Division of Parks and Recreation. Chimney Rock State Park Master Plan. Raleigh: North Carolina Deaprtment of Environment and Natural Resources, 2011. https://archive.org/details/chimneyrockstate00unse (accessed December 15, 2015). French Broad Hustler (Hendersonville, N.C.), July 6, 1916. Asheville Citizen (Asheville, N.C.), July 2, 1916. The Charlotte Observer (Charlotte, N.C.), July 2, 1916. North Carolina Division of State Parks. [Vistors saluting flag circa 1920s.] Photograph. http://digital.ncdcr.gov/cdm/ref/collection/p16062coll27/id/18 (accessed September 1, 2015). [Gov. Mike Easley, members of Morse family and others.] Photograph. January 2007. Collection of North Carolina State Parks. "Greetings from Rutherfordton, N.C." Postcard. ca. 1907. Item H.1971.118.17 from the collection of the N.C. Museum of History. https://collections.ncdcr.gov/RediscoveryProficioPublicSearch/ShowItem.aspx?62557+ (accessed January 18, 2016).